I am finally back! I have been knee deep in book writing, project sewing, and illustrating. I sent a big box off to my editor on Monday, so I am feeling good about meeting a deadline a whole month early! I had to though, since I really needed to get on top of the spring collection. Market will be here before I know it! It has this nasty little habit of creeping up on me!! I thought I would post today about a resource that is just the best. I have been working on a new dress design this week and tweaking the fit here and there. 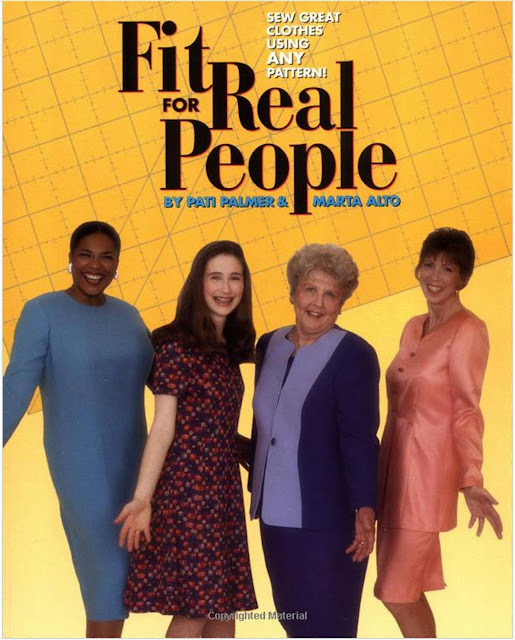 I often refer to a book called Fit for Real People. This is an EXCELLENT resource for getting the best fit from a tissue pattern. You can literally become your own master tailor for your clothing. I know what you are thinking.....why don't patterns just FIT? Well, it is because you can take two people who wear the same size and they won't be able to wear each other's clothes necessarily. As humans, all bodies are certainly not created equal, and I bet you know where you have trouble.....long or short arms/legs? large waist, bust, or hips? maybe a sway back, forward shoulders, or a flat rear end? The list goes on and on and it is the essence of why it can be a challenge to get the right fit straight out of a pattern envelope. A lot of people think that altering is a big deal....IT ISN'T, as long as you have good resources and are willing to spend a little time working through the kinks. Fit for Real People is a great guide because they break down adjustments to a tissue pattern step by step. You can literally use any tissue pattern and make it work for your body....so what are you waiting for?? You can purchase the book here on Amazon for a very reasonable price, and I am sure it is available other places as well. Every time I mention it, someone I know says that they have the book and that they use it to alter the fit of a pattern. It really works. The best part is that you can take bits from it here and there and alter as you want, or you can go all in and draw an outline of your body to do a whole body custom fit by making various muslins, all with expert guidance. Best of all, you will be learning about pattern alteration as you go and will gain confidence to make changes whenever you need to. I can't recommend this book enough! Be sure to check it out! I would love to know if some of you out there have used it and what kind of results you had, so feel free to leave a comment. Happy Craft Month and Happy Sewing!